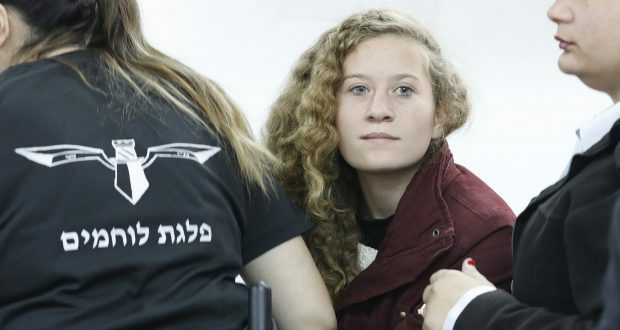 The arrest of 16 year-old Ahed Tamimi and her 21 year old cousin Nur Tamimi following a confrontation with an Israeli soldier has caught global attention and once again highlighted the brutality of the Israeli State’s occupation of Palestine. They confronted the soldiers and challenged them about their presence in the courtyard of their home following the critical injury of a 15 year-old cousin. Ahed now faces up to 12 charges in a military court. Ahed’s mother, Mariman, has also been arrested for filming the incident. Their village, Nebi Sallah, has been the location of regular protests against the theft of water resources by a nearby Israeli Jewish settlement. The water resources have been used by Palestinian farmers and the theft of the water has had a devastating effect on local farms. 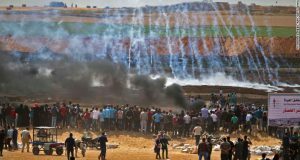 The Israeli Defence Force (IDF) engages in suppression of protests in order to assist the nearby settlement. In the recent past there have been two deaths of young people following IDF attacks on protests in Nebi Sallah. Immediately prior to the confrontation with the Ahed and Nur, their 15 year-old cousin was critically wounded by an IDF rubber bullet. The presence of the IDF in the area was aggressive and designed to provoke a response from the Palestinian community. The Tamimis were rightfully voicing their anger at the presence of the IDF in the area and their suppression of local protest. The video of the confrontation circulated globally on social media. Even though there was no violence in the video and the two heavily armed soldiers retreated, the Israeli right-wing demanded that action be taken. Education minister Naftali Bennet even stated that Ahed should “end her life in prison”. They want a message to go out to Palestinian young people that it is not possible to challenge or confront Israeli soldiers even in a peaceful way. The arrest of Ahed was highly publicised by the IDF and she is now in the notorious Ofer military prison. The case of Ahed Tamimi is a high profile example of the daily realities for young people in the occupied territories. In the past 16 years it is estimated that the average number of children and teenagers killed by the IDF is 16 per month. Since 2000 there have been at least 8,000 Palestinian children arrested, detained or charged with offences in military courts. Three out of four children detained by the IDF experience physical violence. Since 1967 the Palestinian territories have been under military rule with Palestinians being tried in military courts that have a conviction rate in excess of 99%. Judges are serving military officers and typically do not exclude forced confessions. The Socialist Party supports mass resistance of the Palestinian people against the occupation with the right to armed self defence. The resistance of Ahed Tamimi is dangerous to the Israeli ruling class as it has the potential to spark a new “intifada” or mass uprising against Israeli military rule in the occupied territories. 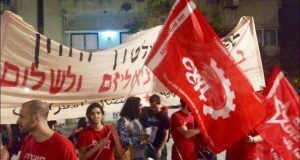 Such a struggle could potentially open up the real class divisions within Israeli society and win the Israeli Jewish working class over to a common struggle against its rotten and oppressive ruling class. 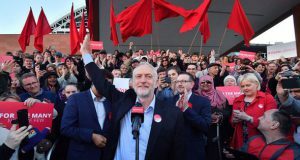 It could also pose the question of a democratic socialist solution to the national question where the Palestinian and Israeli Jewish people have a right to self-determination and democratic ownership and control of the wealth and resources of the region.